This photo to the right is not gefilte fish! Gefilte fish does not come in a jar! Not where I come from. Only in America! “Gefilte” means “stuffed”. “Gefüllter karpfen” in German, “carpe farcie” in French, stuffed carp in English. “stuffed” means stuffed into the fish, not in a jar! When I was young, living in Belgium, my grandmother, who had emigrated from Poland, was in charge of making the gefilte fish for the high holidays. 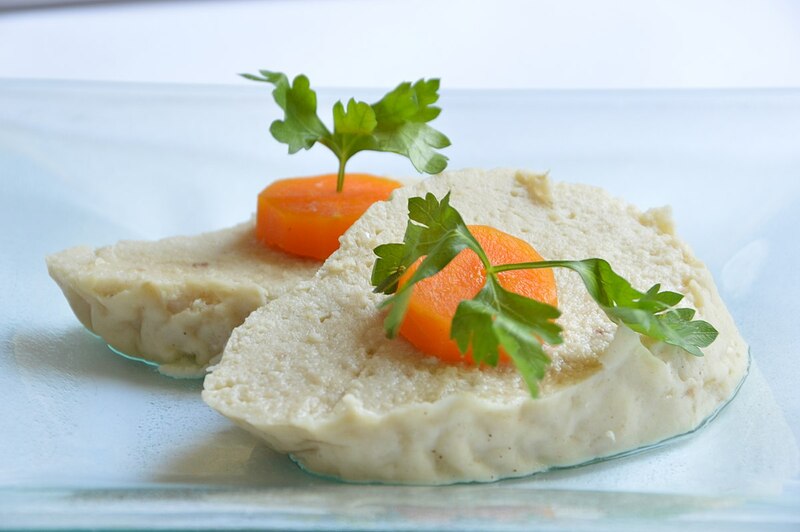 Many folks eat gefilte fish at the Passover Seder, but we ate it at Rosh Hashannah, preceding the chicken soup and the rest of the holiday meal. First, my grandmother Bajla went to the fish store about two weeks before the holiday and ordered two good size live carps. Other, fancier fish could be used but my grandmother stuck with carp, the people’s choice! The fish store was a small ordinary shop on Rue du Mouton Blanc in the Carré area of Liège, my home town. 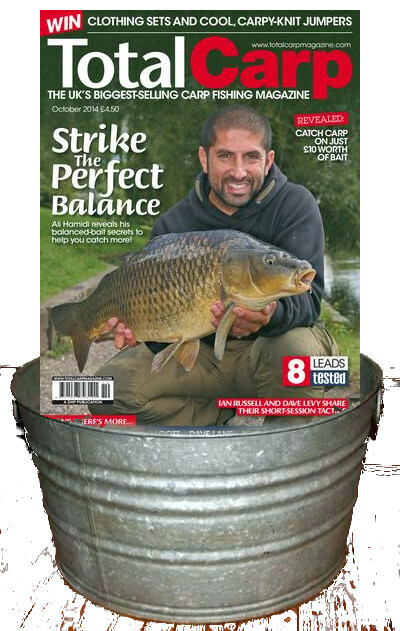 Waiting to the last minute was too risky, ordering early meant that you would get the right size fish, about 4 lbs each, and getting live fish meant it would remain fresh to the last possible moment! My grandmother would bring the fish home alive – how?, I don’t remember – and place it in a large round galvanized steel tub that was used years before to wash and starch clothes. My grandmother kept the tub in the courtyard of our suburban row house. Not much room for the carp but they did not seem to mind as far as I could tell. Then the dreaded moment came! My grandmother grabbed one of the beasts, wrapped it in a large kitchen towel, and banged its head on the table which rendered it unconscious, or worse… Same for the second fish. The poor cyprinus carpii were then promptly moved to the kitchen and gutted. Now it was time to cook. The following recipe is borrowed from a couple of sources together with personal recollections. Heads are cut and scales removed. 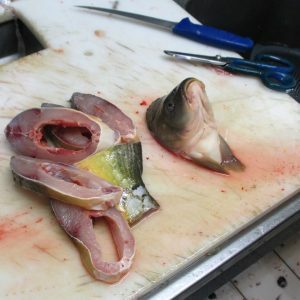 The fish are gutted and cleaned from the neck down by holding the tail so as not to damage the skin and the tail. If necessary, make a very small incision under the belly without piercing the bile. The fish are then sliced into 2-cm or half-an-inch thick steaks. Meat is carefully removed between the skin and the bones from each slice using a small sharp knife. Keep the central ridge connected to the skin, leave flesh against the bones if necessary. do not hesitate to leave some flesh. The meat is set aside for the “stuffing” with about four lbs of extra fillets. Mild white fish such as hake or cod can be used. Pike or whitefish were old country favorites. Let the slices marinate with coarse salt overnight in the refrigerator then wash the salt off. In the morning, chop the fish set aside for the stuffing, along with eight browned onions. Small fish bones are removed. Eight eggs and half-a-pound of matzah meal or bread crumbs are mixed in, with salt, pepper and a little bit of oil. A large cut-up onion and two carrots are laid at the bottom of one or two large pots then filled with cold water half way to the top and brought to medium heat. Peppercorns and a bit of sugar are added, no salt. Fish slices are gently filled with the stuffing mixture and cautiously lowered into the simmering bouillon. The back of the heads may be stuffed. Bones and other fish parts are added to the broth to increase the amount of gelatin. Lower the heat at the first boil and remove the foam. Let cook for two and a half hours, adjusting seasoning after a while and at the end of the cooking period. Let the bouillon cool down, and gently remove the portions onto one or more large dishes, and decorate with carrot slices. Fill the eye cavities with carrots too. Strain the broth and refrigerate all overnight. My grandmother added her unique and amazing twist to this recipe: Over the summer, she collected seeds, also known as stones, pits or kernels from peaches, plums and especially apricots. These pits have amazing and complex aroma. Stone fruit seeds contain amygdalin which is believed poisonous when eaten raw but looses its potency when cooked. Grandma Bajla sliced or broke the dried seeds and added them to the broth while the fish was cooking. Wow, I never heard or saw this done anywhere else. Genius, grandma! Finally, the large platter is brought to the holiday table, covered with gorgeous slices of gefilte fish, each one a marvel of Old Country cookery and engineering, surrounded by sweet broth jelly and garnished with carrot slices. Red horseradish is not far. The holiday meal has started but not a word is said or heard. A reflective mood? No! each of us is savoring the delicate and rich flavors and watching for sharp bones! A quick look at twen… on Auschwitz or Sinai? Rabbinic Judaism: A… on Auschwitz or Sinai?